Gradually limescale in washing machines is formed even under the condition that you have very clean tap water. Also, under high temperatures when washing on the heating element deposited undissolved particles of the powder. To remove scale is not necessary to use professional tools, you just citric acid. Check "escaped" under the rubber parts of the washing machine of small things. The drum needs to be without clothes, because it can be done only in idle mode. Otherwise, the acid not only eats through the rust, but will spoil all the things. Put in the main compartment for powder or put directly into the drum 100-200 g of citric acid. Do not use natural lemon juice for this purpose, to sense from it will not, because its concentration is much lower than that of citric acid. 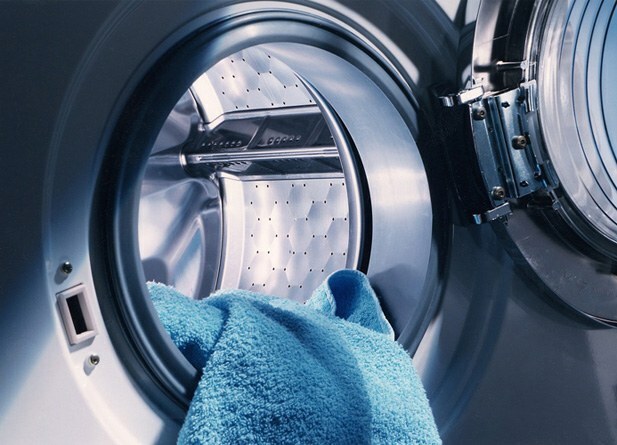 Switch the machine on the longest wash cycle at a temperature of 90-95 degrees and hit the start button. Now you just have to wait until the program will end. But don't forget to monitor the device, because if the heating element the large deposits, they can fall and get caught in the drain machine rinses. If this happens, you will hear a distinctive humming sound when draining. In this case the machine need to turn off and get out of the drain causing the problem - most often large pieces of scale. Then turn on the device to complete the program. After 1-3 hours, when the machine finally washed off, open the drum, and pry between the rubber elements under them may accumulate scale in the form of small pieces. Under elastic wipe with a damp cloth. Then open the drain at the machines and see if there are any major parts that could fall away from the heating element. Cleansing of the machines was successful, you can safely proceed to the Laundry. After this procedure, you will notice that the device began to work almost silently. Clean the washing machine descaling at least once per month. But if you have a very bad and dirty water, more often. Don't worry, citric acid does not injure the gum, and the glass becomes cloudy.